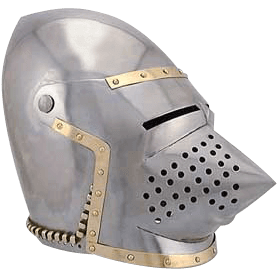 This helm style became popular in the late 13th century widely replacing the Great Helm because of its close fit styling. Towards the late 14th century the long snouted appearance had earned it the English nickname Hounskull, or pig-faced bascinet. This exceptional full size helm is skillfully hand-crafted of 18 gauge steel and adorned with brass accents. Each helm is wearable and will make an impressive addition to your collection.